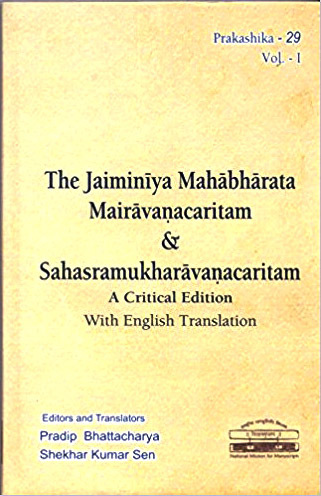 The Jaiminiya Mahabharata: Mairavanacaritam and Sahasramukharavanacaritam, A Critical Edition, National Mission for Manuscripts, New Delhi, 2017. Mairavanacaritam appears to be an independent work of Maharsi Jaimini included in the Jaimini Bharata not claiming connection with any of the parvas. In Mairavana Hanuman builds a rampart with his tail of which neither end can be seen. Mairavana abducts Rama who is rescued by Hanuman. Shasramukhacaritam claims to be part of the Asramavasa parva of the Jaiminiya Mahabharata. It begins with Janmejaya’s queries following the return of Sita and her sons to Rama. Here Sita proceeds to kill the thousand-headed Ravana who had defeated all gods and Rama.